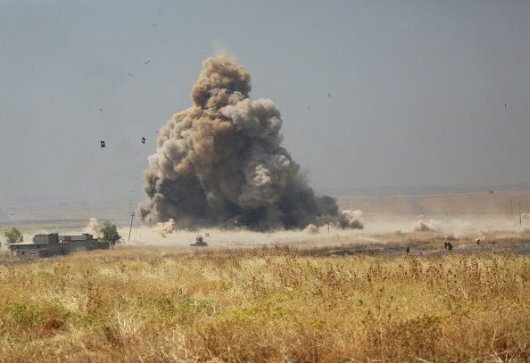 As the second week of the US-led coalition offensive to retake Mosul draws to an end, the Islamic State appears to be in full command of its combat capabilities and nowhere near breaking-point. 1. ISIS’ ability to coordinate and function on the operational level to attain interrelated military objectives is clearly not impaired. 2. The jihadists still command sufficient resources and manpower for launching counter-attacks in Mosul and other parts of Iraq. 3. When they retreat under fire, it is in orderly and disciplined fashion with no signs of breaking up or headlong flight. 4. ISIS’ “mobile defenses” came into play in Mosul when, in the areas where vehicle-borne improvised explosive devices (VBIEDS) were densely strewn, coalition forces suffered devastating casualties. The number of dead and wounded has not been disclosed by Baghdad or Irbil. The VBIEDS tactic is the Islamic State’s answer to US air superiority in the battlefield. It calculates that the Americans don’t have enough warplanes in the arena to defuse them all. 5. Jihadist strategists are capitalizing on the uncertain timeline allotted the coalition’s Mosul operation. Estimates at US and Iraqi command centers this week ranged from six months to two years! None of the forces taking part in the operation – the US, Iraq, Kurdish Peshmerga or Iraqi Shiite militias – can possibly muster the manpower and resources for sustaining 48 months of combat or more. ISIS therefore sees time on its side. 6. Experience from the former campaigns for wresting the Iraqi towns of Ramadi, Tikrit and Fallujah from ISIS showed those towns were never fully cleansed of a jihadist presence; nor were they entirely vanquished. Some Islamists returned to those towns at a later date. 7. The magnitude of this problem is much greater in Mosul, given the size of a population exceeding one million. The coalition army is too small to conquer and hold all parts of the town. The US commanders’ expectation of local uprisings against the ISIS oppressors was brutally thwarted by the mass executions of civilians kidnapped as human shields during the month of October. If the jihadists find their backs are to the wall in the city, they have recourse to two countermeasures: chemical weapons and civilian massacres on a scale that would deter coalition commanders from continuing to press forward. 8. Two additional Islamic terrorist groups are raising their heads on the Syrian-Iraqi border and threatening to join the battle against American, Iraqi and Kurdish forces. One is the ex-Baathist Jaysh Rijal al Tariqa al Naqshabandiya (JRTN), which DEBKA Weekly’s counterterrorism sources identity as a strategic terrorist reserve set up and trained by Saddam Hussein’s generals, who currently command ISIS operations. It is drawn from the Naqshbandi, an Iraqi-Syrian Sufi order of some four million adherents. The other is Al Qaeda, ISIS’ precursor, which awaits orders from Ayman Zawahiri to jump into the fray in Iraq after its Syrian branch, the Nusra Front, helped it get organized. Paradoxically, so long as ISIS can hold off the US-led assault in Mosul, the two groups will stand by in the wings, whereas if ISIS shows signs of flagging, they will move in.